I found this! A FAB way to plan your day and get the RIGHT stuff done. I’ve been doing it a few weeks now and it IS making me more productive! It’s called 1-3-5. I read about it here, but have put my own little slant on it. Here’s my way. 1. The idea of 1-3-5 is that you pre-plan your day and commit to doing one BIG task, three MIDDLE tasks and 5 LITTLE tasks. 2. Start by planning your day the night before. Do you this already? Fab. If you don’t you might like try it. It makes starting the next day SO much easier! 3. The first thing you need to do is decide on your BIG task. A BIG task could be ‘big’ in the sense of time-consuming. But I think it works better if you use the BIG task to mean something that is “important but yucky, stressful, or hard’! We’ve all got stuff to do which we’re not comfortable doing and by designating is as the BIG task I think it really helps us get it done! For example, if you don’t *really* like marketing, your 15 minute marketing could be your BIG task. Whatever you pick, just one BIG task a day makes it easier to swallow! 4. Next you need to find three MIDDLE tasks. The MIDDLE tasks are one’s that are important, enjoyable and quite chunky in the time department. One of *my* MIDDLE tasks for today is writing this week’s ‘Snacks-Daily Juice-Scrapbook’ combo. I enjoy it so it’s not a BIG task, but it takes quite a lot of time (indeed!). I’ve experimented and found three MIDDLE tasks a day is about right for me. If you work shorter days (around kids, say) then you might want to just do two. 5. Finally decide on your five LITTLE tasks! The LITTLE tasks are those annoying bits and bobs of which there are plenty. The idea of limiting them to five is that otherwise you could spend your whole day on the little stuff and not get done ANY of the scary BIG things or fun-but-time-consuming MIDDLE things. 6. To make this system work, you might need to divide some of your tasks into little bits. So say your BIG task is to get all your financial info ready to send to your accountant, that could, in fact, be a MAMMOTH task! When I have a MAMMOTH task I split it up into, say, 5 bits of maybe an hour long – that way I’ve got BIG things for a week and I get to spread out the awfulness! What do you reckon? 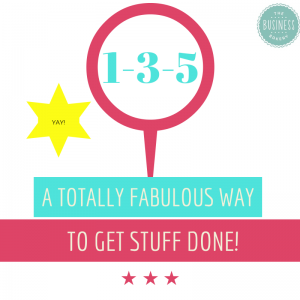 Keen to give 1-3-5 a try?! What to do when someone doesn’t like what you sell! A totally FUN way to Reflect and Refresh Why I started MY business and why YOU started YOURS Why you *totally* need a THINK day and how to make it work! 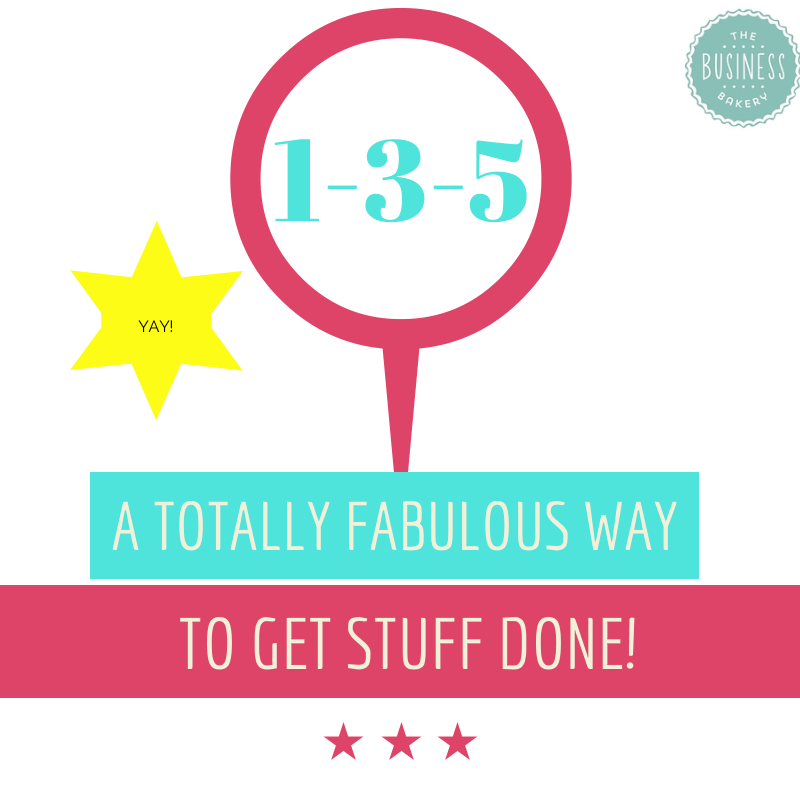 16 Comments on "The 1-3-5 way to get stuff done"
Thanks Steph. It really does work and you feel SO good at the end of it! I’ve always been someone who tried to put WAY too much on the list for each day too! Oops I meant ‘9 things’ above not 8 things! Yes I am writing out my 1-3-5 list for tomorrow and am excited to see how it goes. Thanks for the great articles Julia, I read your posts all the time and love the advice you share! Love this! Going to give it a try. Whilst i have days of great productivity i also have ones where i am my own worst enemy. Consistency is key and this could be the approach i need, thank you…. Excellent tips Julia! I defiantly would love to become more productive so I’ll give this a go. Hmmm, an interesting concept – might have to give it a try! Love the idea Julia and I’m going to try to do that. I’m getting ready to start a small business and might check into your April class. I’m artsy and business things scare me a little! Your whole website idea is so clever and unique. I look forward to learning more. I really love your site 🙂 Been giving me the push I’ve needed in starting my own business. You’ve also given me piece of mind on how and what to charge. This will really help with my 100 Day goal – thank you!